The 2017-18 English Championship season kicks off on Saturday August 5 and Ladbrokes are offering an unmissable offer on the opening match Sunderland v Derby! Open a new account via this page and claim 25/1 Derby to beat Sunderland, plus money back if you lose! After a few questionable managerial appointments last year, Derby now look to have the right man in Gary Rowett and are tipped to be play-off contenders this season. Their opening match is not so simple as they face freshly relegated Sunderland away from home. Anyway, the Rams are receiving strong support in the match winner market and their odds have shortened to 2/1. Fancy Derby County to win? Don't miss this offer! Get a terrific 25/1 Derby to beat the Black Cats! 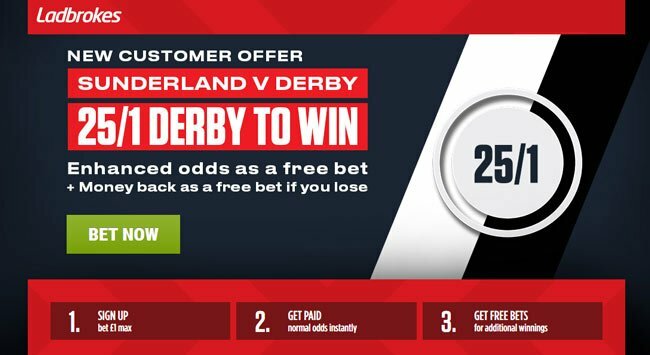 Join Ladbrokes via our special links and claim 25/1 for Derby to beat Sunderland! 3) Place a single bet of up to €/£1 on Derby to beat Sunderland in the 'Match Winner' market before the kick off. 2. Bets placed in accordance with the terms and conditions will be eligible for the enhanced odds of 25/1 on Derby to win. Maximum one qualifying bet per customer. 3. If the bet loses, we will refund your stake up to €/£/1 as a free bet, paid into your account within 24 hours. 4. This offer is available from 08:00 on Wednesday 2nd August 2017 until 19:45 on Friday 4th August 2017. "Get 25/1 Derby to beat Sunderland at Ladbrokes (Championship opening match price boost)"